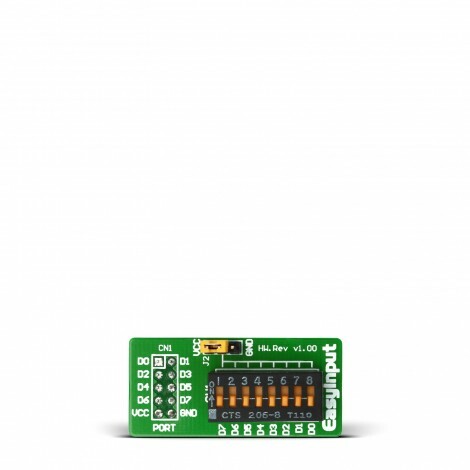 EasyInput is an accessory board used for providing digital logic input to desired IDC10 PORT header. It features tri-state DIP switch for 8 PORT pins. EasyInput is an accessory board used for providing digital logic input to desired IDC10 PORT header. It features tri-state DIP switch for 8 PORT pins. In elegant and convenient way, with a push of a switch, you can provide logic one (VCC) or logic zero (GND) to desired pin. Middle position leaves the pin unaffected. EasyInput is commonly used to customize the behavior of an electronic device for specific applications. This board enables you to easily create VCC and GND inputs.